these sandwiches Chinese they are often served in tea houses, along with fried rolls and ravioli of different kinds, steamed or sautéed. When I was visiting relatives in Hong Kong, there was no lack of a day when we did not go to one or another tea house for lunch to eat! 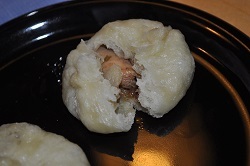 You can be prepared with different fillings, both meat and vegetarian, and why not, even in some sweet versions; Here it used a very simple and delicate filling of chicken, bamboo, shi-take mushrooms and oyster sauce. This is a dish in which the time for preparation are interspersed with long waiting periods: It can be useful to prepare the stuffing the day before and store in the fridge. For the dough Dissolve yeast in warm water with sugar and a tablespoon of flour; let it grow well in a warm place (eg oven to 35 + °). Then add to the flour and lard and mix by hand or with the planetary. After the first five minutes add salt and optionally other water; for a short time. The dough is ready when it detaches itself from the walls of the planetary. Let it grow for half an hour sheltered from drafts and away from the cold. cut the chicken into small cubes and season with salt, pepper and half of liquor and soy sauce. Squeeze the mushrooms soaked in warm water for half an hour and then reduce them into small cubes as well as bamboo. Heat oil in a wok or frying pan and brown the chicken briefly; then add mushrooms and bamboo, the whole season and then add the rest of the seasonings dissolved in a little 'of water with the cornstarch. As soon as the sauce begins to thicken pour the filling into a container and let it cool. Take the dough and knead by hand for about ten minutes. Then store and let rise another hour. Take it back, cut it into pieces and roll into balls then form with your hands diskette; depending on the size will be obtained from sixteen to twenty pieces. Spread the filling on the disks and then, resting the disk on the palm of your hand, enclose (in Chinese, precisely "bao") gently hand to form a small sphere of filled pasta. Lay gradually sandwiches on small squares of parchment paper (preferably perforated) because they do not stick and let it rest for about fifteen minutes, possibly covered. Place them in a container for cooking steamed or in the typical bamboo baskets and cook them in the water vapor bubbles already at very high heat for ten minutes at least. The baozi will be ready when their volume will more than double. They should be served warm seasoned eventually with the soy sauce. 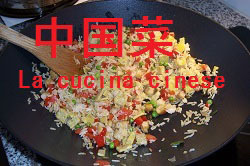 As indicated at the beginning of the description, here a chicken based filling has been used. There are several other fillings, and in the near future will be well described and photographed. The stuffed chicken love to children who among others adore the idea of ​​a sandwich that, magically, already contains the stuffing! The filling may be prepared also in good quantity and then stored, portioned, in the freezer. The dough can be prepared the day before, if desired, and then stored in the refrigerator. Go left then an hour at room temperature before working it.